My Journey to Fit: Volunteering - Can I Get a Witness? Volunteering - Can I Get a Witness? One of the things I didn't anticipate doing as a hospital volunteer (in the gift shop, no less), was being needed as a witness when patients signed legal documents. The policy at the hospital is that no paid staff can be a witness because it's considered a conflict of interest. OK, then - that leaves the volunteers. Two witnesses are needed, and I've been called upon to help out on occasion. It's a strange feeling - I'm more than happy to help, of course - but let's face it, no one is signing these forms for entertainment. One time a patient going into surgery signed over power of attorney to his/her spouse (I feel like I need to be really general here due to HIPAA regulations). The other volunteer and I were brought into the pre op room and tried to stay out of the way of the nurse as she did her preparations, while the coordinator explained what the patient was signing. When we were finished, I wasn't quite sure what to say: "good luck" sounded too flippant, and yet I couldn't come up with anything else. Another witness situation was much more intense. We were summoned to a patient's room to witness the signing of a DNR (do not resuscitate) for a patient who was being transferred to the hospice facility. GULP. A family member was signing the form, while their loved one lay nearby in the hospital bed. I'm sure there were some tough decisions being made in that room, and again, while I was happy to provide whatever miniscule help I could to them during that process, it also felt like I was invading a very private situation. It was a somber reminder to me that while we get to see a lot of happy moments downstairs in the gift shop, there's also some way more serious things going on in other parts of the hospital. Switching gears, a lot of those happy moments involve new babies. It's so fun when family and friends of someone who is upstairs, either in labor, or who has just given birth, come into the gift shop to celebrate-shop. The joy of a new baby is contagious, and I love that I get to share it with our customers. We sell everything - pink and blue bubble gum cigars, balloons, flowers, door announcements, stuffed animals, adorable baby clothing, tiny socks...it's all so cute! I've had many memorable customers, but my latest involves a very muscular man who came into the gift shop holding a pink-lined infant carrier. Big guy with a tiny baby...or so I thought. He walked in and turned toward our baby section, so I didn't get to see the baby. Well, that wouldn't do! I walked over to him, said hello, and looked into the carrier, only to see two cans of Vienna sausages. That's it - no baby - just food! I asked him where the baby was, and he told me she was still upstairs - she'd just been born and he was bringing the carrier in to take her home. 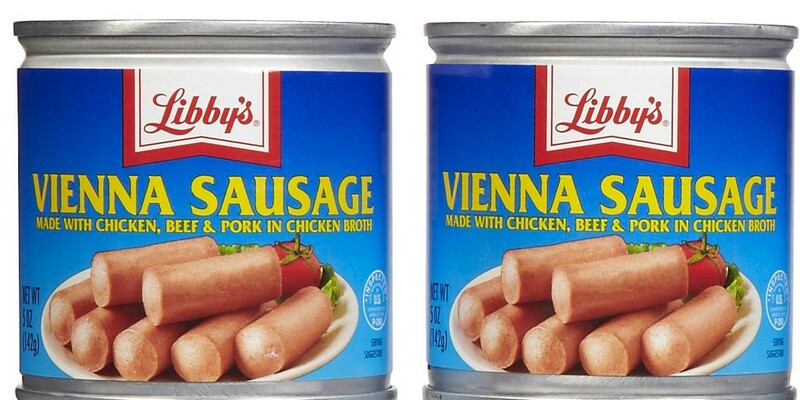 Still doesn't explain the Vienna sausages, but I guess when your wife is in the hospital having a baby, you grab what you can to eat? 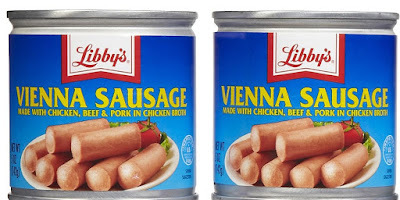 Maybe Vienna sausages are the new protein for gym dudes, I don't know. Anyway, he told me that this was their fourth child but first girl. He was looking for something to give her, and after answering his questions on a couple of items, I left him alone to browse. You guys. He must have spent at least 20 minutes going over everything, trying to choose just the right gift for his new baby girl. Eventually he came to the check out counter with a soft little teddy bear that was wearing a pink t-shirt with the saying "Daddy's Little Princess" on it. The sight of this giant muscle man holding this tiny teddy bear was so sweet! I rang up the bear while my co-volunteer wrapped it in a bag with lots of pink tissue paper. As the man left, he said he'd bring the baby by when they left to so we could see her...which we didn't think would happen for a hot minute - let's face it, when you, as a new mom, are being discharged from the hospital, the last thing you want to do is swing by the gift shop to show some random strangers your baby - but it was sweet of him to want to do that, regardless. I like volunteering at the hospital - it brings me back to a great time in my life, when I was a candy striper in high school. I like that I can still help people, or at least make them laugh or smile, at least for a moment. And I'm grateful that I have the free time available to spend doing this. I certainly would have asked what the sausages where doing in his carrier LOL. We Dutchies are pretty direct and I'm no exception so I would have asked. Guess everything has to be signed by a witness because of lawsuits? Because I never heard it here except when you want DNR but not even sure if your signature is enough than or that you need a witness too. Luckily I never had to deal with that (yet). I think it's great you are volunteering, volunteers are very valuable and necessary for society. Any legal document has to have witnesses when it's signed...is that not the case in your country? I just thought it was normal, everywhere. No not every document. You need a witness when you get married or sign for a mortgage and at a DNR or euthanasia. But if we have to go to the hospital for surgery we don't have to sign anything. All the paperwork needing to be done is just insane in the medical field. Witnessed oral and written consent for anything, even getting shots. All thanks to our litigious society. LOL @ Fran. "Why do you have those sausages sir?" I can just picture it! It's nice that you get a bit of involvement of the daily life at the hospital and you're not just there ringing a register. I think new babies would be my favorite too. There's a good bit of interaction with the customers that I like...let's face it, I can talk to anyone. I'm still perplexed by the DNR signature. Maybe its different state to state. When a baby occasionally required a DNR there was only a written doctor's order. In his notes, he would write about the discussion he had with the parents. I volunteered in the hospital in high school, too. It's an honor to get to help families of those who are hurting and celebrating new life. What a wonderful volunteer opportunity you have & I'm sure all your customers are happy to chat with you. Thanks for sharing the story about the new dad!! I've visited the gift shop on more than a dozen occasions during Tony's various hospital stays - mostly buying magazines or Chapstick, but the ladies were always super nice. Yep, the downside of the hospital is that good things happen (babies!) while other people die - my husbands doctor told me that it's difficult for him when he loses a patient - especially since Tony had been with him for 25 years! I am in awe of the volunteers in hospitals. It is truly a place of mixed blessings, saying hello to new lives and making people well again, or giving them gentle and compassionate care when they leave this world. Hugs to you and all volunteers who help!! !